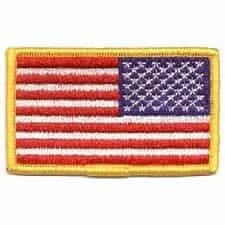 Home > Shop by Category > Accessories > Emblems > United State Embroidered Flag (Reverse) - 3-3/8" x 2"
Home > Shop by Gender > Men > Coveralls > Embroidery Services > United State Embroidered Flag (Reverse) - 3-3/8" x 2"
U.S. 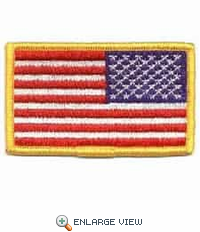 FLAG - Full Color (Reverse) - 3-3/8 x 2"
Army Regulation 670-1, Wear and Appearance of Army Uniforms and Insignia, updated most recently on February 3, 2005, addresses explicitly the proper and lawful placement of the U.S. flag patch on the Army uniform. The regulation states that when authorized for application to the proper uniform the American flag patch is to be worn, right or left shoulder, so that the star field faces forward, or to the flags own right. When worn in this manner, the flag is facing to the observers right, and gives the effect of the flag flying in the breeze as the wearer moves forward. The appropriate replica for the right shoulder sleeve is identified as the reverse side flag. We appreciate and share your concern for the respectful display of our American flag on the uniform of the U.S. Armed Forces. For more information contact the United States Army.